Celebrity chef Emeril Lagasse has been one to watch in New Orleans since the early 1990s, and since bursting onto the international food scene with shows on Food Network, books and more, he has become one of New Orleans’ own best and brightest. On Saturday, November 9, 2013, he hosted the annual “Carnivale du Vin” gala to benefit the Emeril Lagasse Foundation, along with other local notables including chefs Donald Link and Mario Batali. Voted the James Beard Foundation’s 2013 Humanitarian of the Year, Lagasse and his foundation work tirelessly to inspire, mentor and enable all young people, especially those from disadvantaged circumstances, to realize their full potential, whatever paths they choose. All proceeds from the weekend went to realizing the goals of the Emeril Lagasse Foundation. Friday night’s “Boudin, Bourbon and Beer” event at the Foundry featured specialty brews by Abita Beer, bourbon by Buffalo Trace, spirits by Sazerac and wine by Jim Clendenen of Au Bon Climat Winery, Justin Vineyards and Landmark Vineyards. The weekend also included a popular and recent trend – Robert X. Fogarty’s Dear World project, in which the photographer captures events and moments in time by allowing his subjects to write messages on themselves with black marker. Guests were entertained Friday evening by the Lost Bayou Ramblers. 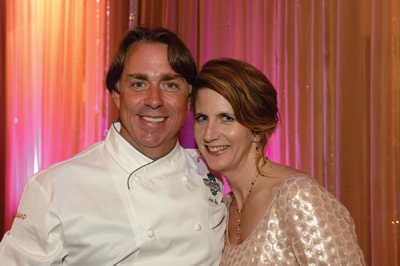 Saturday’s revelers at the “Carnivale du Vin “enjoyed a reception featuring Caymus Vineyards and Louisiana seafood by chefs John Besh, Cat Cora, Rick Moonen and Aaron Sanchez. Dinner followed, prepared by chef Lagasse and his chefs de cuisine, while music was provided by Sammy Hagar and the Wabos and Locos Por Juana.